My oldest boar Derek a 2 1/2 years old was taken into the vet this evening she is an exotic vet and it was my first time seeing her as Derek thankfully has been very healthy. I took him in today because I noticed yesterday he was acting a bit off. Derek begs for food all day everyday constantly biting the cage bars. Yesterday he stopped completely looking for me to give him food or biting bars. I weigh weekly and not real big weight loss just a few grams here and there. I had did his weigh in the day before and since he was acting off weighed him again and he was -20gr from the day before. He’s eating hay and eating pellets some lettuce but nothing hard like carrots or cucumbers. I can see when he’s chewing he’s having a hard time as well. Anyway vet looked at his teeth and said the the bottom front is too long but could not see his back teeth because he had to much food. She also did a swab of one his ears and tested it and said he has a “yeast infection” her words exactly and will work on his ears and teeth trimming on Wednesday that he will be sedated so I will have to leave him for a few hours. I’m just super worried does this sound right? I read that the back teeth should be checked before doing any work on front teeth, also is sedation necessary? Yeast infection in ear is that right? I’m just so worry for him he really hates being around unfamiliar people and noises he doesn’t like to be handled but will cuddle next to me. He also screamed really loud several times while she was examining him is that normal? Sorry for all the questions you guys. I look forward to hearing what you all think. Sedation helps. Generally vets will use an otoscope to peer in and check out the molars (what dentists use - it has a light and magnifier). As you have read, frequently there is something going on with the molars if there are teeth issues. It could be a spur cutting the mouth or something else. I am glad you are so observant. A yeast infection is certainly possible, but probably not much to worry about. What I'd want to confirm is that she plans to do more than just trim his front teeth. They only overgrow if there's something wrong with the molars or the jaw, so clipping them won't help for more than a few days, if that much. If the molars have overgrown or have spurs, they'll need to be planed. She also needs to x-ray the skull to make sure that the problem isn't elongated molars or an abscessed tooth. Read all the pages in the teeth area. Thank you very much @bpatters and @lynx I will get more information on the procedure tomorrow prior to his appointment. Today he really stopped eating much at all, picking on pellets and hay only I am syringe feeding critical care but I am not sure exactly how much to give him he weighs 1,440grams currently. Also I had to separate him from his cage mate last night got into a minor fight no wounds they never fight so I assume it’s ‘cause Derek is not well. I put bars in between there c&c cage they each now have a 3x4 space, I hope that is enough space. if he's eating nothing else, he needs 140 cc of Critical Care per day, split into 6-8 feedings around the clock. Thank you @bpatters really helped me with the dosage. Update: he went into the vet for scheduled surgery. The vet said she checked his molars but didn’t see anything wrong and was unable to do X-rays (I was pretty upset about this) she did clip his front teeth and gave meloxicam for the next 3 days once a day. He’s basically back to square one, trying to eat but struggles like if food is getting stuck somehow in his teeth. I feel like this is a clear sign it’s the back teeth right? And I expressed this to the vet. Is it normal cause it’s only been a few hours since he got home? Will it get better over time or is my vet that supposed to be an exotic vet not do a good job. 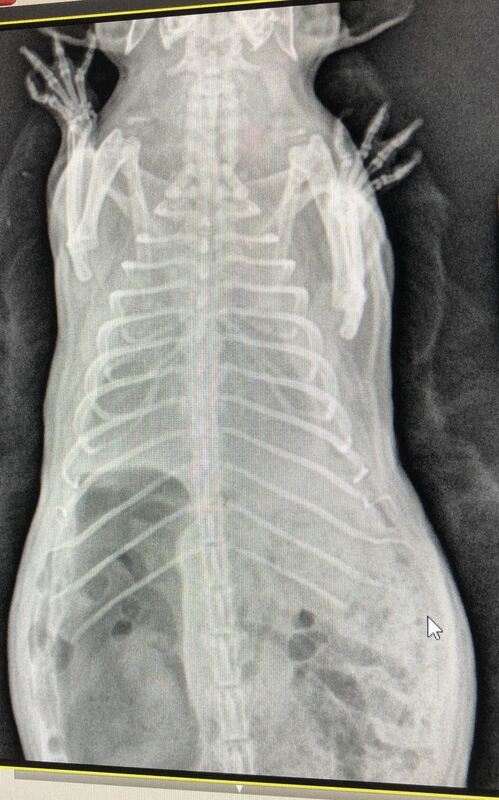 Unable to do x-rays? Did she say why? After the first dose of meloxicam, I'd split the dose in half and give it twice a day. It just will not carry a pig through 24 hours. It does sound like the problem is the molars, if she didn't see anything wrong with the teeth and didn't do an x-ray, there's no way to know whether the problem is elongated roots or an abscessed tooth or something else. I think I'd be wanting another opinion from another vet, preferably one with rodent dentist experience. If you look at the vet bios on the websites, you can generally tell whether they've got somebody with the experience you need. After the teeth trimming he seemed to almost get back to his old self everything was good. Yesterday he suddenly stops eating everything with no interest in food at all. Vet today takes X-rays so much fluid in his chest she is unable to see his heart and lungs send me home with doxycycline 1.4ml 2x a day. His breathing is so hard looks like he’s really struggling. She said she will send the X-rays to a specialist to see if they can see possibly what it could be and recommend I take him to a 24/hr hospital to stay on oxygen. I’m not sure what to do or what to think. 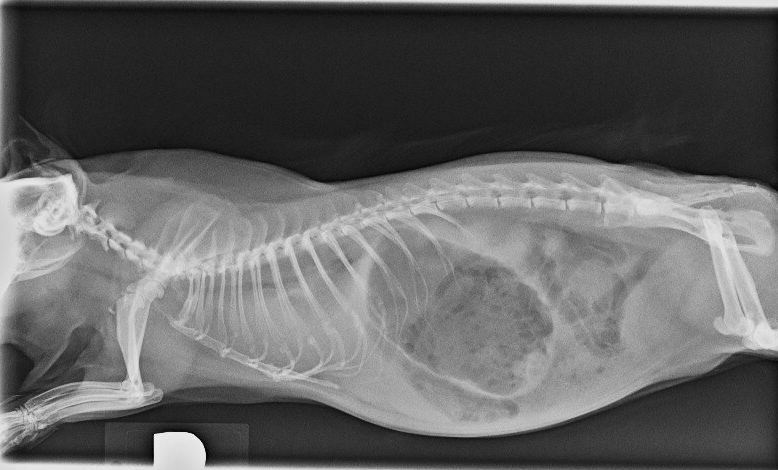 I have 2 photos of the X-rays I took myself and maybe someone has past experience. 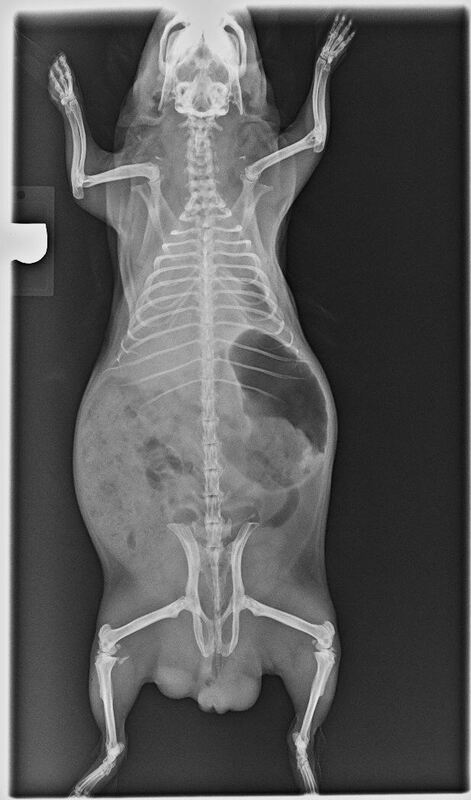 Let me know if you'd like me to add your xrays to your thread permanently for future readers. I just wanted to do an update on my baby Derek, as I referred to this site so often and maybe someone will find this useful. The day of my last post as directed by my vet I brought him into a exotics animal hospital as his breathing was really bad and refused to eat anything at all. He spent the night at the hospital, a CT was done and blood work. Vet called that night to say she believed it was a really bad case of pneumonia and that he was doing ok.
A few hours later I received the call I dreaded so much my baby had passed away. I was beyond devastated. I read over so many possible things I could think could be wrong with him and I believe it was ultimately his heart. $2,500 later and I’m still unsure what really happened and regrettably didn’t do necropsy. 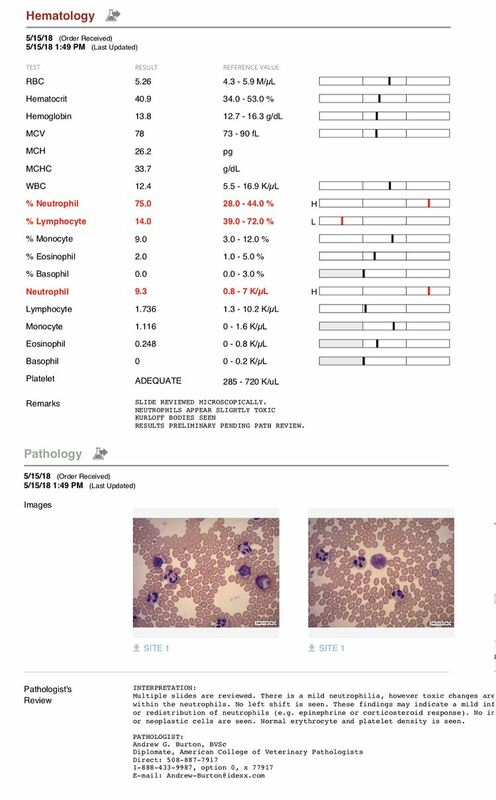 Anyway I have included results of blood work and ct scan results just as a reference for anyone that might be seeking information. He went from doing well to passing away within 24hours, things I noticed that morning: heavy breathing, no interests in food at all or even pedialyte (that he loved), a weird sound that I believe was a hooting sound. I am so very sorry for your loss. I understand how painful it can be to lose such a well-loved pet. You have our sympathy. Let me know if you'd like your images added permanently to your thread for future readers. Yes of course please add them permanently. Thank you very much Lynx. Could you fill in the blanks on the pathologist's review? Some end words are cut off. Multiple slides are reviewed. There is a mild neutrophilia, however toxic changes are ??? within the neutrophils. No left shift is seen. These findings may indicate a mild inflammation? or redistribution of neutrophils (e.g. epinephrine or corticosteriod response). No irregular? or neoplastic cells are seen. Normal erythrocyte and platelet density is seen. I was rereading your thread. This seemed to come on so quickly. I know you did all you could. Of course lynx. I didn’t even notice it didn’t upload correctly. This is the full interpretation. So quickly. It all happened within 24/hrs. 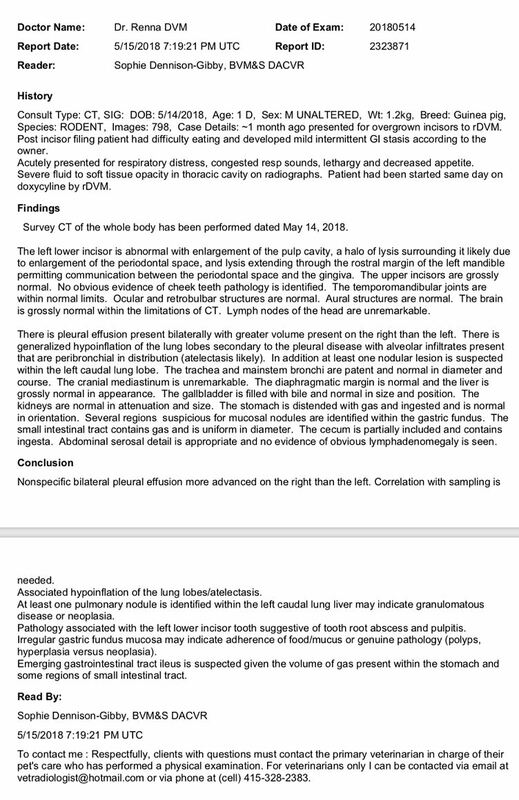 I’m not entirely sure what most of the reports mean but I see fluid in lungs, possible collapsed lung. Still not sure. If could go back in time I would have done the necropsy. Thanks for clarifying that. I highlighted your additions.